Move It! 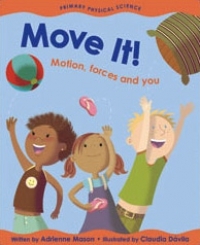 takes the physics of why and how things move and transforms it into an enjoyable and easy-to-understand first science book. Move It! is part of the Primary Physical Sciences series. These books include easy-to-read text, hands-on activities, energetic illustrations and a special section for parents and teachers with more activity ideas and information. This series was created with the cooperation of a Primary Science consultant and fits science curricula in the largest states and provinces.